Before our own show on May 21st, you can enjoy another great concert featuring seven differnt acts called Heroes Wear Boots. 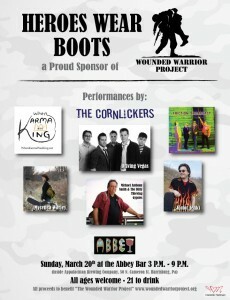 This event will be held on Sunday, March 20th at the Abbey Bar at Appalachian Brewing Company, Harrisburg. This show will also benefit The Wounded Warrior Project and will feature Victor Jenks, Mycenea Worley, Michael Anthony Smith and the Dirty Thieving Thieves, Friction Broadcast, The Cornlickers, When Karma Was King and Driving Vegas. This is an all ages show that starts at 3:00 PM until 9:00 PM. Donations will be accepted at the door. More info on Heroes Wear Boots. © 2010-2019 Sound Off for Vets. All Rights Reserved.